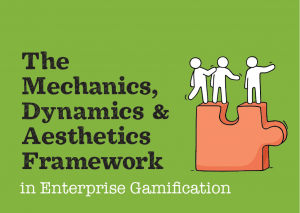 Join us on June 1st 12:00 for a free webinar on enterprise gamification with Dr Umar Ruhi, where we will understand the connections between end user motivations, gamification features and interactivity to create effective enterprise gamification interventions. Dr. Umar Ruhi teaches at the Telfer School of Management at the University of Ottawa, Canada. Recently, Umar conducted an empirical research investigation of gamification initiatives across three case study organizations. He published a research paper with his research findings, and formulated a descriptive framework for meaningful enterprise gamification. He will discuss this framework and related insights and best practices in our webinar. At the University of Ottawa, Umar Ruhi teaches various undergraduate and graduate courses in Management Information Systems and E-Business. His current research interests include enterprise gamification, IT consumerization, enterprise social media strategy, and end-user development. Umar’s research has been recognized through best paper awards at several conferences, and his PhD won the best dissertation prize from the German Society for Online Research. Umar Ruhi has also been involved in consulting, advisory, and analytical roles with initiatives related to online communities, e-government portals, user experience design, web usability engineering, web analytics, and knowledge management practices. Before joining academia, Umar worked as a management consultant with engagements ranging from strategic & operational planning to multi-site technology deployment for different e-Business ventures. GamEffective is a leading workforce performance gamification company, helping companies engage employees to improve motivation and learning. One of just four Gartner Cool Vendors for HR Software, GamEffective is a unique blend of next generation performance management and Employee Gamification 2.0. It helps companies engage and motivate employees by setting goals and tracking their performance in real time. GamEffective provides real-time feedback as well as dynamic goal setting for employees and managers to drive better performance– doing away with stale goals stated in once-a-year reviews. By showing goals and objectives to employees, it acts like a fitness tracker for work. The GamEffective platform can easily integrate with existing enterprise applications, providing a deep and effective gamification solution that significantly improves performance.